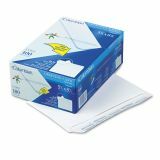 Columbian Greeting Card Envelope, Grip Seal, A9, 5 3/4 x 8 3/4, White, 100/Box - Greeting card envelopes are designed for computer-generated invitations, announcements and seasonal greetings. Design offers the convenient and secure Grip-Seal flap, which requires no moisture. Simply peel off the release strip and press down for a quick, secure seal. Envelopes are sized to hold an 8-1/2 x 11" sheet of paper folded in half."